The Atlanta native Halcyon Way is a band built on true grit and genuine rock chops. Having been recording and performing for more than a decade, they have existed on the periphery of the mainstream rock atmosphere, occupying a healthy place touring in support of larger acts and on their own. 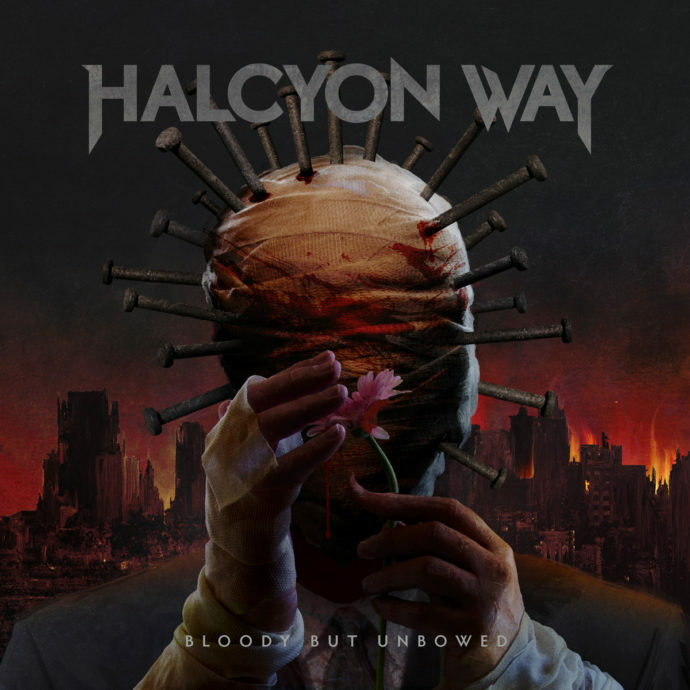 Falling somewhere between the epic metal virtuosity of Iron Maiden and the more modern songwriting trappings of groups like Slipknot and Sixx AM, Halcon Way crafts songs that are very technical and necessarily heavy but well balanced in terms of their melodic elements. With their newest effort, Bloody But Unbowed, the quintet has produced a collection that is at once a sociopolitical perspective and a pronouncement of their own endurance in the harsh reality of the music industry. Opening with the compelling and conceptual prelude, “Deevolutionize”, the band sets the stage for the rest of the album as part of a larger theme of social commentary. The album’s title track follows, a brutal testament to survival amid adversity. Perhaps more personal than some tracks on the album, “Bloody But Unbowed” is a strong start, showcasing the dual vocal styles from lead singer Steve Braun, who croons and soars above the chaos, and lead guitarist Jon Bodan, whose beastly contributions are a complement nearly every time they appear. The lead single, “Blame” is a bit of a mixed bag. Rhythmically compelling but lacking diversity in the lyrical department, the tune is quite catchy even if it sounds a bit generic in the album’s full context. The song’s message is quite interesting though, casting light on the sad state of the political landscape in which there seems to be far more scapegoating than compromise and problem solving. “Slaves To Silicon” is easily one of the best tracks on the album, infectious and well paced in its execution. The interplay between the clean and guttural vocals is excellent and the bridge splendidly delivers a tasteful guitar solo that stands apart. The song’s lyrics address the addictive nature of cell phones and other stimulating devices. The middle of the album is highlighted by the uplifting “Primal Scream” which sees the band distilling their sound into an almost pop-radio format. The track doesn’t suffer though with some crushing riffs, an epic guitar solo segment, and a smooth chorus with some solid vocal work. “The Church of Me” is another standout that addresses the growing narcissitic attitude in social media culture. While a little overwrought in its message, the song is bright and exuberant, featuring some excellent backing vocals in the chorus that lend an additional level of catchiness to the band’s arsenal. The accompanying “Cast Another Stone” is another infectious number that confronts hypocrisy in religion. Pure power metal with a bristling breakdown. The album nears its conclusion with some pretty brutal fare in “Burning The Summit”. More progressively oriented, the song features a really cool instrumental section in its second half that gives it some psychedelic flavor. The closer, “Desolate” is not much of a standout but it manages to fill its six minute run time with enough variety to make it a good listen. Oddly it ends the album on a fadeout rather than something definitive. Bloody But Unbowed is a strong release from a band that has honestly cut their teeth in the music business. The production is clean and well balanced, though a little muddy when it comes to picking out the bass in the mix. In some ways this works against the record, as the songs tend to conform to rather standard song structures and it becomes difficult to feel there is much variety to be had. The technical execution is evident in every song, but given the level of talent in Halcyon Way it would be refreshing to hear them flesh their sound out into a more expansive direction. Ultimately they should do what works for them, and the songs on Bloody But Unbowed succeed in that. Several of the tracks are rather thought provoking even without elaborate lyricism or too much of a heavy handed message. This is another talent for the band, as they are able to produce songs that can appeal to both casual listeners and those that want their music to have a message. Fans of the band should greatly enjoy this release, and perhaps with their knack for crafting melodically fetching songs the fellows in Halcyon Way will receive some well-deserved attention from a wider audience.